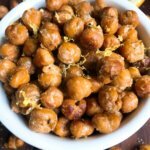 Mediterranean flavored crunchy chickpeas. Great as a snack on their own or topped on a salad! Drain and rinse the chickpeas. Place them between two clean towels or paper towels and gently pat dry, removing as much moisture as you can. (If you want to remove the skins, press more firmly to peel many of them off. Leaving the skin on will provide a little extra crunch and fiber – this is a preference decision). Toss the dried chickpeas with the olive oil and salt. Spread the chickpeas out on a silicon baking mat lined baking sheet (or spray tin foil with cooking spray). Bake for 35-40 minutes until the beans are starting to take on a little color and get dry. Turn off the oven and leave the beans in the oven to continue drying out to your desired crunchiness, checking every 10-15 minutes. (I like mine crunchy and leave them in for 30-40 minutes post-baking). Put the cooked chickpeas in a small bowl. Juice 1/2 lemon into the beans and add the oregano and garlic powder. Toss to coat. Adjust seasoning as desired with any of the spices. (For a strong lemon flavor, it is best to add more lemon zest and not just juice as the juice will saturate the beans, making them less crunchy, if you use too much). If you want the chickpeas extra crunchy, you can cook them at 400F instead of 350F but watch them closely as they can start to over-darken!